It's been a few weeks since my last update for Dear Friend and Gardener, but in those few weeks there wasn't much to report. However, the occasion of snow on April 15th seems like a reason to write and provide an update on my veg garden and share a few pictures. "Mr Avery said it was written on the Rosetta Stone that when children disobeyed their parents, smoked cigarettes and made war on each other, the seasons would change; Jem and I were burdened with the guilt of contributing to the aberrations of nature, thereby causing unhappiness to our neighbors and discomfort to ourselves." If Mr. Avery was right about misbehaving children causing aberrations of nature then some kids have been very bad, given our colder than normal, snowier than normal, winter followed by snow and cold on April 15th. But honestly, I feel lucky when I walk around my garden. 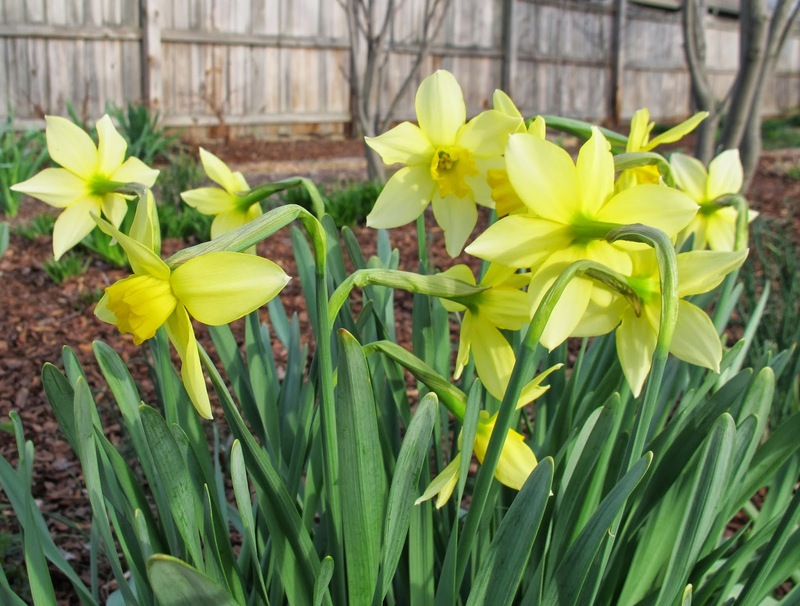 I don't think I've lost too many plants to the harsh winter and yesterday's snow doesn't seem to have affected the daffodils and other spring blooms. I took this picture this evening. I do like these particular daffodils. I hope they'll stay blooming for a few more days until Easter. 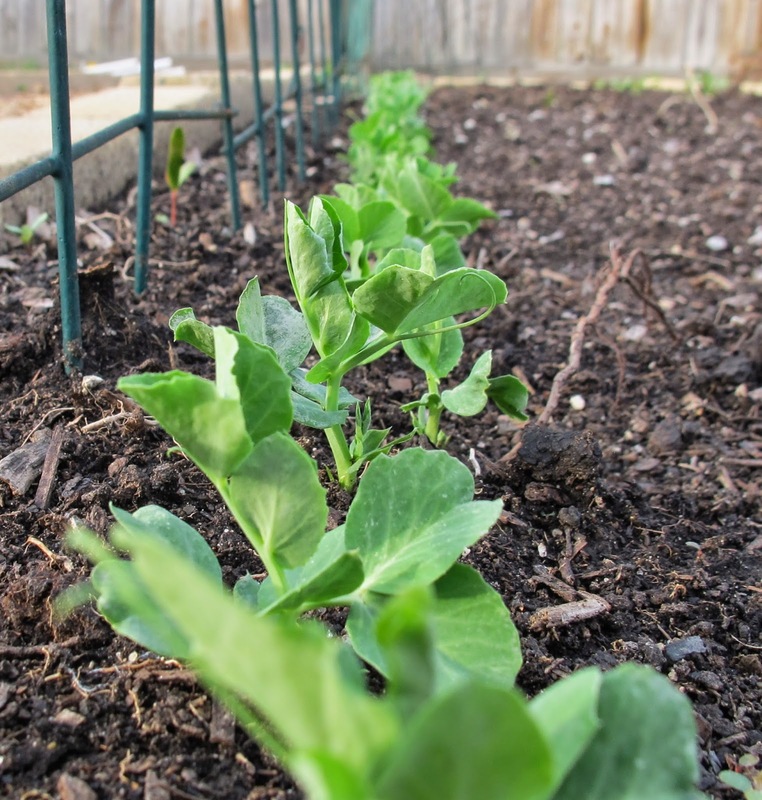 Out in the veg garden, the peas are up and growing. I should really start covering these with white cloth before the rabbits discover them and munch down the entire row. While I'm doing that I might as well cover the next bed over because the lettuce, radish, spinach, and Swiss chard have all germinated and are also a favorite food of the rabbits. I really wish the rabbits would eat thistle plants. I had a lot of thistle weeds last year and this spring they are popping up all over the place. Thistle is one plant I wish the winter cold had killed off, but no such luck. I see weeding in my future. Lots of weeding. While I'm on the downer subject of weeds, I might as well tell you the other bad news. I think all my tomato and pepper seedlings are kaput. I'm not sure if it was the soil I used, but the seedlings just never looked right when they started to grow their first sets of true leaves, which are smaller than usual. Fertilizing them didn't seem to help at all. I may have given them an overdose. Poor little seedlings. I'm giving them another week and if they don't come out of it, they'll start new lives as compost and I'll just buy my pepper and tomato plants. I have a few other updates to share, about ducks and potatoes and blueberries, but I'll save those for another letter another time. I look forward to hearing about your gardens now. Time to get out the plastic spoons! Or was it forks? 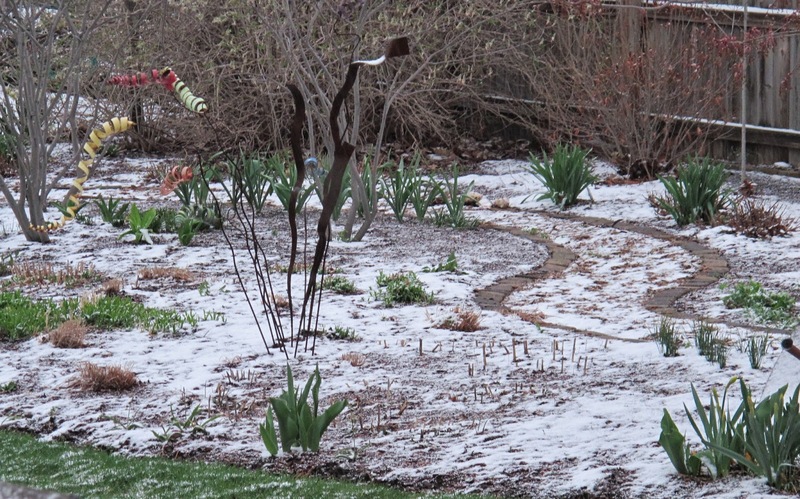 No real snow here in that storm, but the 24F low did whack the blooming daffodils. Luckily another group was ready to take their place.